As of Sep. 30, the Ebola virus had killed more than 3,000 people in the West African countries of Liberia, Sierra Leone, Guinea and Nigeria, according to the latest numbers released by the World Health Organization. 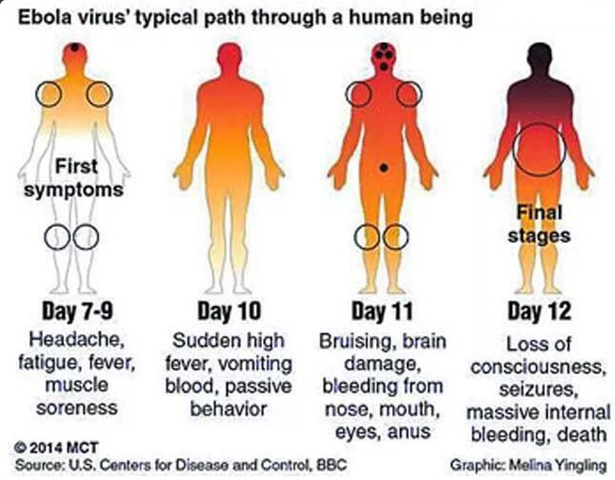 As the virus spreads and medical workers feverishly battle to contain it, we wanted to know, how exactly is this virus transmitted from human to human? 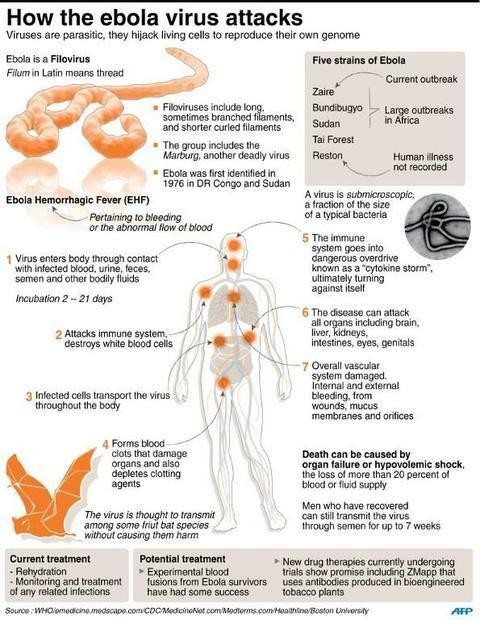 Ebola is one of the world’s most virulent diseases. 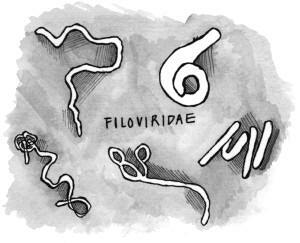 It comes from an extended family of viruses called Filoviridae, which also include the deadly Marburg virus. It is a swift and effective killer, known to kill up to 90 percent of those it infects. And it is a “hemorrhagic fever virus,” which means it causes fluid to leak from blood vessels, resulting in a dangerously low drop in blood pressure. All viruses contain “attachment proteins,” which, as the name suggests, attach to host cells through the cells’ “receptor sites.” This is how they invade healthy human cells. While some virus particles are shaped like spheres, the particles that make up Ebola are filament-like in structure, giving them more surface area to potentially attack a greater number of cells. Each Ebola virus particle is covered in a membrane of these attachment proteins, or glycoproteins. Imagine Ebola’s glycoproteins as giant oak trees with branches and leaves, said Erica Ollmann Saphire, a structural biologist at the Scripps Research Institute. The Ebola virus has its own critical receptor site, which lies beneath these branches and leaves to avoid detection from the immune system. Each glycoprotein can attach itself to a host cell in a number of different ways, but once its branches fasten themselves to a host cell’s molecules, that host cell pulls in the attachment protein, slicing off its leaves and branches and exposing the trunk, the virus’s receptor site. 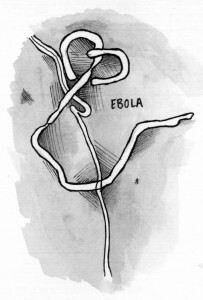 Ebola spreads through direct contact with infected bodily fluids or tissue. The virus can be transmitted when an infected person’s vomit, blood or other fluids contact another person’s mouth, eyes or openings in their skin, said Dr. Ameesh Mehta, an infectious disease doctor at Emory University. Even after a person has died, the virus persists. In West Africa where funeral rites include washing, touching and kissing corpses by family members, putting the dead to rest can be just as deadly as caring for a living patient. Ebola’s sucker punch is its speed of replication. 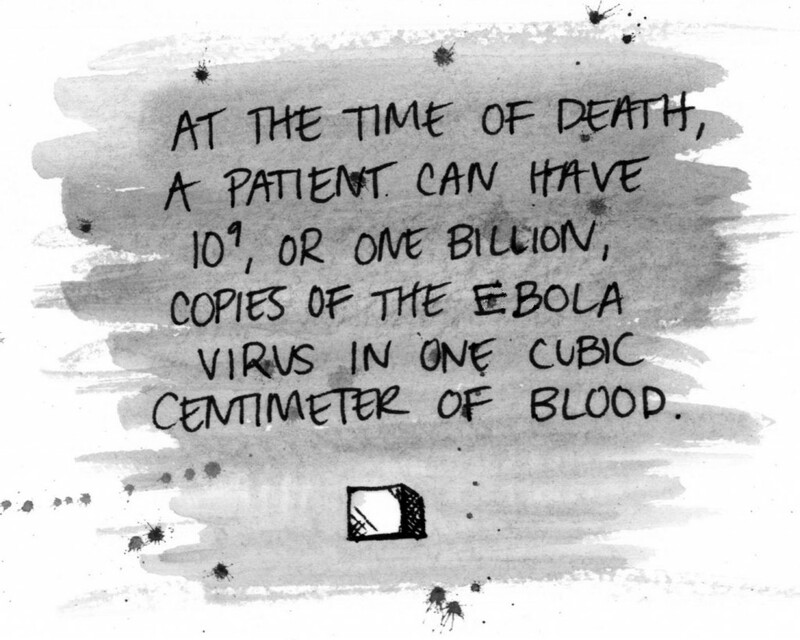 At the time of death, a patient can have 1 billion copies of the virus in one cubic centimeter of blood. In comparison, HIV, a similar virus, has the same rate at the time of death. But unlike HIV, which only infects two types of immune cells, Ebola first infects white blood cells that disable the body’s ability to destroy foreign substances, then seizes nearly every cell type. This process takes anywhere from two to 21 days (though it’s typically between four to 10 days). When the immune system begins breaking down, the symptoms begin to show. Patients experience fevers, headaches and fatigue early on. After the virus overwhelms healthy cells, they burst, causing a chemical release leading to inflammation. Their remains are taken over by other cells, perpetuating the virus. As the symptoms worsen, patients suffer from bloody diarrhea, severe sore throat, jaundice, vomiting or loss of appetite. Infected cells that haven’t yet burst carry the virus through the bloodstream to invade different parts of the body like the lymph nodes, spleen and liver. When infected cells attach themselves to the inside of blood vessels, it weakens them, causing fluids to leak. This triggers the uncontrollable bleeding for which Ebola is known, though it only happens for about 50 percent of patients and occurs mostly inside the body. In fatal cases, blood pressure plummets after blood vessel damage, and death from shock or multiple organ failure occurs within six to 16 days. Saphire is part of a large, multi-site team made up of 25 laboratories that’s mapping Ebola’s glycoprotein to better understand and defeat the virus. Among the potential strategies they’re studying is an antibody cocktail called ZMapp, an experimental drug that drew media attention after its use on two U.S. aid workers and three Liberian doctors. First developed by the U.S. Army Medical Research Institute for Infectious Diseases a decade ago, this “Ebola serum” potentially works to neutralize the virus by preventing its rearrangement and flagging it for destruction by the immune system. Clinical trials for ZMapp are set to begin in 2015, but according to Saphire, doses for “experimental compassionate therapy,” treatment provided to critically-ill patients before the drug has been approved, could be ready in three months. In addition, due to its extreme nature, there are far fewer human studies on Ebola than other similar viruses. While the recent outbreak is not expected to reach far beyond West Africa, researchers like science writer Richard Preston fear the beginning of a more deadly and longer-lasting epidemic if the virus finds its way to metropolitan areas like Lagos, Nigeria, which has a population larger than the state of New York. Despite Ebola’s pervasive spread, Cummings says the biggest misconceptions are that Ebola is easily transmitted and that the outbreak in West Africa could reach global levels. While one should still exercise caution, Cummings says the requirement of transmission of fluids makes the disease more difficult to get if you’re not directly treating patients. “It is more controllable than people realize.” But prevention is the key. By learning how the disease is transmitted, Preppers can become aware of this and avoid situations where infection is likely.